I have been particularly impressed by the significant work being created through the project “Little Stars” which informs and promotes the value of pediatric palliative care for children with life limiting conditions and for their families. It would a unique opportunity for “Merimna” to be included in the “Little Stars” project, and be part of this international project. 1, A Pediatric Palliative Home Care Service for children with a life-threatening illness to whom we offer medical, nursing, psychosocial and spiritual support at home, while supporting siblings, parents, and grandparents during the child’s illness and death. 3, Community Psychosocial Interventions after a mass disaster or traumatic event which deeply affects children, families, schools, and local communities. This year we celebrate Merimna’s 20th anniversary. During these years we have made a social contribution that includes the provision of bereavement support and pediatric palliative care services to more than 50,000 children and their parents the organization of 5 panhellenic conferences (two of which were on Pediatric Palliative Care) and 331 workshops and seminars all over Greece, as well as the training of 325 health care professionals and educators through annual programs. Given the financial and social crisis in Greece, “Merimna” has been deeply affected as it relies entirely on donations from individuals, companies, and foundations to operate and expand its services. Unfortunately, donations have been reduced to such an extent, that in 2015, we are facing serious reductions in the provision of pediatric palliative care and bereavement support services, and we are even considering having to close one of our programs. Our Pediatric Palliative Home Care Service was developed in 2010, and since then 80 children were offered end of life care and family support at home. In 2014 we cared for 27 children and their families throughout the year but unfortunately had to turn down 10 additional requests, due to budget constraints. Right now we have 14 children and families under our care. We have a fundraising plan for the year of our anniversary. However, if the financial constraints continue, the Board of Directors will seriously have to consider closing down either the Pediatric Palliative Home Care Service or the Family Bereavement Counseling Center in Athens. Given the uncertain financial situation, Merimna’s business plan comprises an evaluation of its economic status three times per year. – To connect with other international programs described in “Little Stars” which face similar challenges and, hopefully, to join forces and find effective ways to secure funding for pediatric palliative home care services internationally. 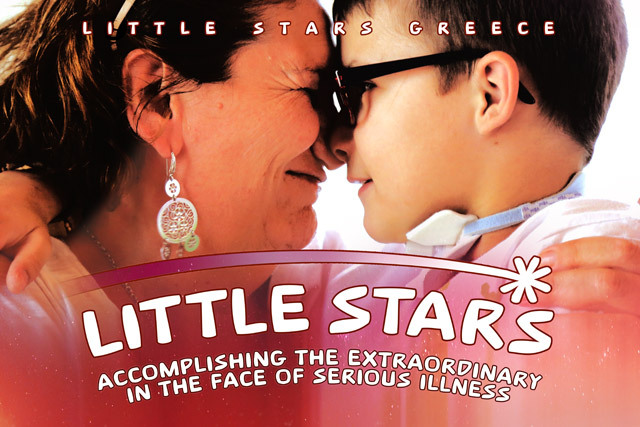 We would be delighted to collaborate with you on the project “Little Stars” so as to strengthen the possibility that children and families in Greece will continue to benefit from our services, since we are the only organization that provides them in this country. We thank you for your willingness to mobilize the local community in order to raise the necessary funds that will cover the costs of including Greek children and families in your documentary.